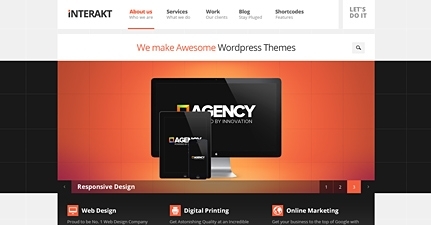 Create your own Agency website with Wordpress and Wordpress Theme – Interakt. I recommend WordPress because WordPress is the best and easiest way to create a site. 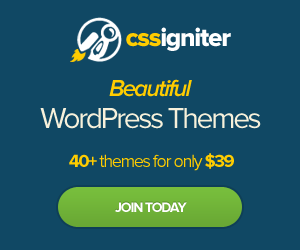 You can also install this Interakt Wordpress Theme which will instantly transform your blog into a professional and modern site for a Business Agency, Corporate, Business, Business Portfolio, Business Firms, Creative Studios, Computer Agency, Consulting firm or any other Business needs you require. Interakt Wordpress Theme features include responsive design, portfolio layout, scrolling featured posts, list of clients, list of employees, list of technologies used. There are several custom pages created for you to easily create pages for pricing tables, contact us pages, services offered, and more. Click here to see more features of Responsive Business Agency Theme Interakt. A responsive WordPress theme perfectly suited for all kinds of agency websites, corporate and business firms and last but not least creative studios in search of a new and modern web presence. It doesn’t matter if viewers use desktops, tablets or smartphones, your visitors will enjoy the same remarkable experience. All the elements scale and resize depending on the device the website is viewed on. You can change the colors, textures and bg images at the click of a button from the WordPress admin. You can customize your Business Agency Website to any color you want. You can match it to your Company Business colors. No more fiddling with server settings & complex WordPress install process. Interakt WordPress theme has a one click install feature that the Themefuse framework will auto-installs the theme for you. I think this is a great modern WordPress Theme to create a fresh Business Website. I love the content sliders and unique features in the Interakt WordPress Theme. When you take a demo of the theme, check out the content slider on the Frontpage. The bar highlights when you hover over the link and the image also changes color. I also just found a Careers page, it must be one of the custom templates provided as well with the theme. You can list available positions within your company. Each job description you can list the location, experience level required, qualifications and goals. There is an apply button along with HR contact details. This is a really amazing since I’ve never seen that feature in any Business WordPress Theme. I highly recommend this WordPress Theme if you want to create a Business Corporate Website.